This is really a book of cures for the various diseases mentioned, stemming from facts and the experiences the author went though. There’s a wealth of great information that makes it a fabulous reference book, much easier than wading through the amount of often sketchy information out there on the Internet — and Felice is as reliable a source as one could find! 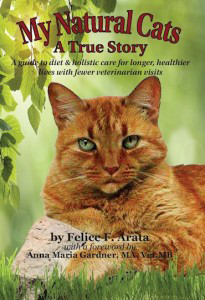 There’s also a lot of great information about raw diets and how GOOD they are for our cats, and much information to help the newbie. It should be the first thing we grab when there are questions about our cats!